A Parents Best Book of the Year! 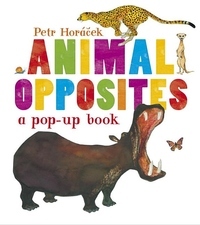 Celebrated illustrator Petr Horácek offers a pop-up introduction to opposites with the help of a variety of creatures. Turn the pages, lift the flaps, and see animals of all shapes and sizes bring the world of opposites to life. From slow snail to fast cheetah, heavy hippo to light butterfly, smooth frog to prickly porcupine, Petr Horácek's brightly colored pop-up animals and interactive flaps make early learning irresistible and fun.